Sunday's game was a thriller... and some of us still aren't ready to move past it. But as Coach Belichick says "We're onto Miami"
But before we jump to th next opponent lets take a look at some of the winners and losers from the Patriots vs Cardinals game. Jimmy surprised a lot of us in his first ever career start. But what else were we expecting from the Patriots. Their whole philosophy is "Next Man Up" it's just the Patriot way. Jimmy had a solid night completing 24 of his 33 passes for 264 yards. Jimmy also rushed for 12 yards on 4 attempts and got three receiving yards off of a tipped ball. The man commanded the team well. As we look ahead to next week, look for Jimmy to be more in control and have a better grip on the ball with Miami's tough defensive line. Doesn't everyone love a good comeback story. When Chris Long was cut by the Rams last spring, his career was assumed to be positioned in a downward spiral. Until the Patriots signed him. Long had himself an excellent season opener with 1 sack, 1 tackle for loss, and 1 quarterback hit totaling three tackles on the night. Long proved to be a viable veteran to fill the hole left by Chandler Jones in the Patriots defensive line. Edelman was in the zone on Sunday night completing all 7 of his targets for catches. He had 64 yards on the night including his longest catch of 19 yards. Edelman also delivered a forceful hit on one of the Cardinals players, resulting in a $26,000 fine. After the win, Edelman gave a shoutout to his beloved quarterback, making all of us love Julian even more. Hopefully Julian's prediction is right and they'll get a couple more wins before Tom Brady gets back. Chris Hogan made a stellar first impression on Patriots fan in his debut with the team. He completed 3 of his 4 targets for 60 yards. He also caught the first touchdown pass of the season, with a beautiful 37 yard throw from Jimmy Garoppolo. Hogan's season looks bright as he hopes to fill the void left by Brandon LaFell. We shouldn't really be surprised by this one. In an excellent team win it's unfortunate that not everyone shined. Marcus Cannon's play wasn't up to our expectations, especially when he got turnstyled on the Strip Sack. If we want to continue our success Cannon must play better, because every team is only as good as their weakest link. Everyone knows that the golden rule of trash talk is that you must be able to back that talk up. And Carson Palmer did quite the opposite of that on Sunday night. After saying that "Tom Brady deserved to serve a suspension for getting caught" he went onto the field and faced the wrath of the Patriots defense. 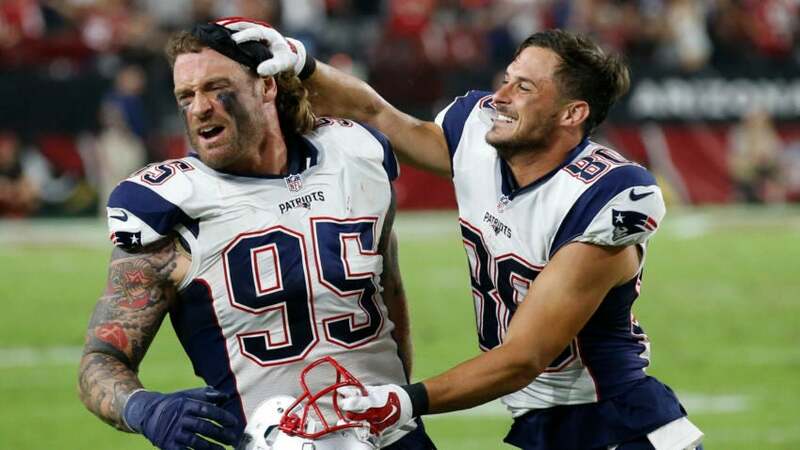 Carson was tormented by the Patriots defense and was sacked three times by rookie Vincent Valentine, Chris Long, and Jamie Collins along with five quarterback hits. The Patriots showed him that he shouldn't run his mouth before facing a newly found rival. When the game is on the line and you just need to seal the deal, not all kickers can be as clutch as Stephen Gostkowski. Including Chandler Catanzaro. As all of Patriot Nation held their breath as the ball was badly snapped, we all let out a sigh of relief as Catanzaro's 47 yard field goal attempt hooked wide left, guaranteeing the Patriots victory. After the kick, celebration ensued, much like after the last time the Patriots played in Glendale.